On Saturday, Mother Nature teased Torontonians with some much-need spring-like weather. And while the days to follow have been damp and gloomy, warmer temperatures are on the way, according to The Weather Network. 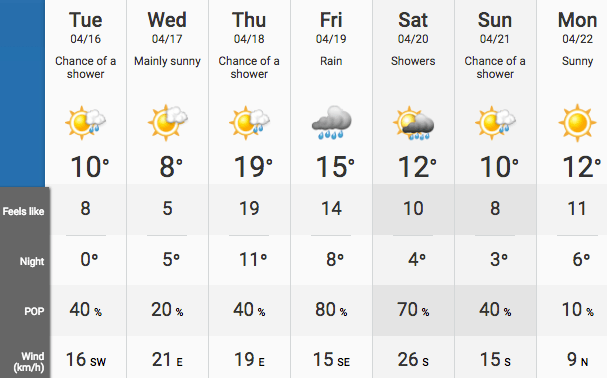 This Thursday, April 18, Torontonians can look forward to sunshine and a high of 19°C. However, there is a slight chance of rain, but hey, will take it over freezing temperatures any day. As we head into the Easter long weekend, temperatures will remain in the double digits, with a high of 15°C on the forecast for Friday, which will drop slightly down to 12°C on Saturday, followed by 10°C on Sunday. There is a small chance of rain expected nearly every day this week, but at least it’s not snow. If the sunshine and warm temperatures continue at this rate, we might be able to see High Park’s cherry blossoms reach peak bloom sooner than later.